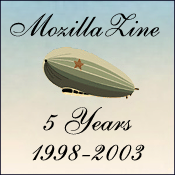 It's hard for me to believe that MozillaZine is five years old today, and how popular it has become! When Mozilla was first released, there was a lack of Mozilla community news and opinion. MozillaZine was designed to meet that need, and over the years it has scaled to meet the demands of the growing Mozilla community. Through the wonderful work of Jason Kersey, Steve Morrison, Asa Dotzler, Alex Bishop, James Cox (who is doing a great job with the setup and maintenance of the new server), and all of our forum moderators, MozillaZine has expanded well beyond my expectations, receiving ~17,000,000 page views a month at last count. Along the way we've done many interesting things with the site. A few of the ideas that I tried worked. Many more failed. But the fun was in the trying, and in meeting the great personalities that went into the daily development of Mozilla. I'm astounded by the quality of talent that was — and is still involved — in Mozilla's progress. These people won my admiration from the start, and it has only grown over the years. To me, the MozillaZine translation pages bring the most satisfaction. We were, as far as I know, one of the first sites to allow our content to be translated and repurposed for other audiences. The Creative Commons and the whole idea of Open Content is still relatively new on the scene, but MozillaZine was a pioneer in this regard. It shows what good things can happen when information is shared freely with trusted peers. Keep an eye out for more on this in the coming weeks. The mature Mozilla is now starting to fight (along with Opera, Safari, and others) a second browser war against an aging and institutionally bankrupt Internet Explorer, and is beating it soundly in recent reviews. Has IE's time come? Don't count it out yet. Microsoft will probably have a few tricks up its sleeve with its Longhorn release, and it's important that the Mozilla group start looking towards the future: new means of interaction in the browser interface and new technologies to bind us in our common human enterprise. And all this while defending a space for open, standards-compliant, language-independent, cross-platform browsing, pushing ahead to make sure that no one is denied access due to incompatible or proprietary technologies. Mozilla is doing more than competing — it is leading the way. With the advent of the Mozilla Foundation and the demise of Netscape, Mozilla has a chance to step out from the shadow of its biggest corporate contributor and chart a new course. We left Microsoft in charge, and we've seen the results play out in the nightly news, as one virus after another takes advantage of our hapless Windows systems. We're finding that a single company is incapable of being the steward of the Internet (and it shouldn't be, in any case). We need a robust Internet, with well-supported standards, not proprietary, bug-ridden technologies with limited support and limited access to the developer. We need developers looking to expand access to all, not restrict it and stifle it. I hope that, with renewed vigor following the announcement of the Mozilla Foundation, we can start convincing the world of the need for technology like Mozilla. To reword the catchphrase of a current American presidential hopeful, It's time to take back our Internet! Thanks again to everyone, developers and users alike, who have stuck with Mozilla through the past five years. May the next five be as eventful as the first!